Grab your bike and ride with us from Oakland to the steps of the Capitol in Sacramento to support public education. We will charter buses that can transport 150 people from Sacramento to Oakland. Bikes of riders taking the buses will be transported by rented box trucks, very carefully loaded, and unloaded by trained volunteers; we will use moving blankets and bungee cords to secure and protect bikes during transport. Transportation from Sacramento to Oakland must be reserved and booked ahead of time to ensure a space on a bus. 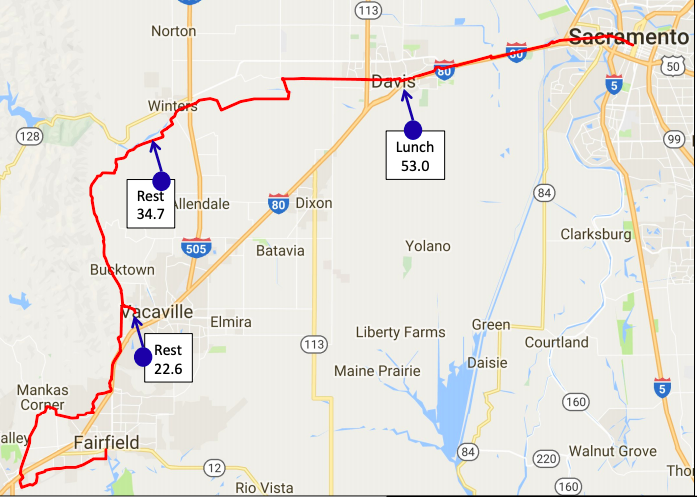 Folks doing the 65-mile course should plan to take the Capitol Corridor train from Emeryville to Suisun-Fairfield to start that course. You will need to purchase tickets for yourself and make sure to bring a photo ID. More details to follow. It also is possible to arrange your own transportation home on the Capitol Corridor train from Sacramento. If you choose to take the train home, we strongly recommend purchasing a ticket on the train that departs Sacramento at 5:40 PM. Capitol Corridor will configure a special car for us on that train, which can accommodate up to 50 riders and their bikes. Become part of the R4R Team and help 275 riders successfully get to Sacramento! All volunteers receive a t-shirt, food during your shift, and our endless appreciation. All volunteers must be 18 or older or accompanied by an adult. Check the Ride for A Reason website for Volunteer shifts. 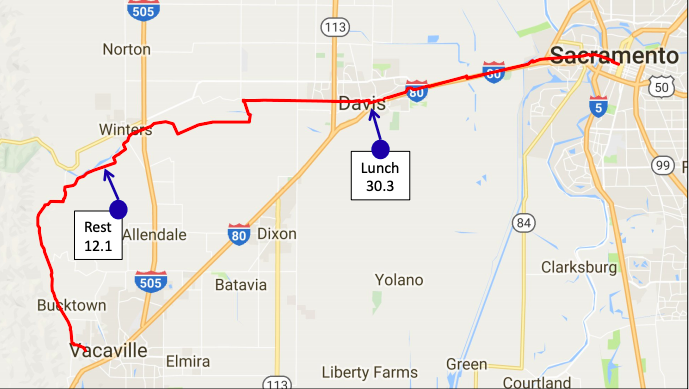 What kind of “support” is provided on the day of the ride? We provide breakfast, lunch, and all the fluids and energy products you will need throughout the day. There are five rest stops on the 109-mile course, and several other locations where SAG wagons (support vehicles) will be stopped and you can receive fluids or energy products. We also provide you with a set of route directions, and route markers will be posted to help you to avoid getting lost. We will have SAG wagons roaming the course throughout the day to provide assistance to riders (e.g., minor bike repairs, first aid, fluids, energy products), and transportation to riders who are not able to make it to the finish line by the designated cut-off time. What should I wear and bring on the day of the ride? In the spring, we experience a wide range of temperature and weather conditions. Wool, polypropylene, and lycra all breathe very well and keep you warm/dry in wet weather. We advise you to save a cotton shirt for the finish line! You need to bring personal identification and a medical card. You are strongly encouraged to bring a cell phone and some cash. You are required to wear a bike helmet in order to participate. We also recommend that you wear a good pair of cycling shorts with a chamois to keep you comfortable en route, and a pair of padded bike gloves. If you signed up for the 109-mile ride, you also should consider using clip-in pedals/cycling shoes, or pedals with toe-clips. You should have a comfortable seat, and at least one large (24 ounces) water bottle, and a water bottle holder on your bike. At Oakland Tech on the morning of the ride, prior to starting the ride, you can check-in a change of clothes (to wear after completing the ride), and/or any layers you would like to shed before you start. We’ll have plastic bags and marker pens to keep track of your clothes, which they will be transported to Sacramento, where you can pick them up after you finish. Do I need to ride a road bike? A lightweight road bike is highly recommended to complete the 109-mile ride. All bikes regardless should be fitted with slicks (tires with smooth, not knobby, treads) to reduce rolling resistance to improve your efficiency and enjoyment of the ride. Make sure your bike is in good working order and safe to ride before you start. Keep it tuned-up, tires properly inflated, chain clean and well lubricated, and brakes and derailleurs properly adjusted and in good working order. 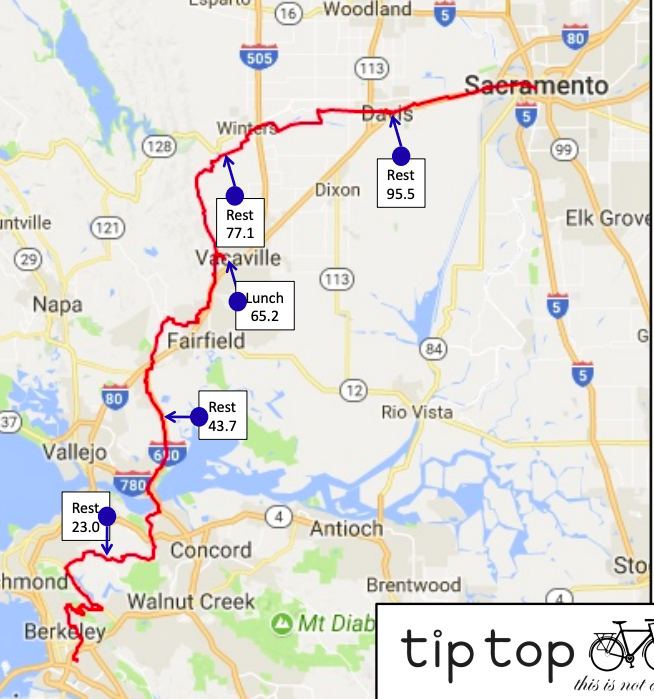 If you need a tune-up, please consider taking your bike to our friends at Tip-Top Bike Shop in Oakland who are generous sponsors of Ride for a Reason. How was Ride For A Reason?